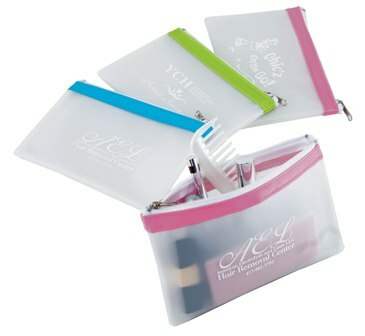 Pearl white cosmetic bag accented with designer pastel nylon bands. Water resistant vinyl. 7" X 4 1/2"
250 1 color(s) imprint at $332 ONLY $1.33 each. 500 1 color(s) imprint at $524 ONLY $1.05 each. 1000 1 color(s) imprint at $959 ONLY $0.96 each. 2500 1 color(s) imprint at $2,302 ONLY $0.92 each. 5000 1 color(s) imprint at $4,508 ONLY $0.90 each.